Father Russell J. DeSimone, O.S.A. 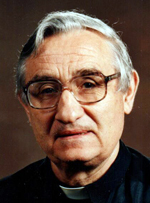 Augustinian Father Russell J. DeSimone died Dec. 29 at St. Thomas of Villanova Monastery, Villanova, at the age of 90. He was the younger brother of retired Philadelphia Auxiliary Bishop Louis A. DeSimone. Known internationally as a Patristic scholar, he taught the life and works of the fathers of the early church, especially Novatian, a Roman presbyter. He also taught for over 38 years at the Patristic Institute, Augustinianum, as well as at the Angelicum, both in Rome. He was one of three brothers who entered the priesthood, the only children of Anthony and Nicolina De Simone, formerly of Bridgeport, Montgomery County. A younger brother, Msgr. Salvatore De Simone, passed away in 1989, while pastor of St. Thomas Church in Brigantine, N.J.
Father DeSimone is survived by his older brother and the friars of the Province of St. Thomas of Villanova. Father DeSimone’s funeral Mass will be celebrated at St. Thomas of Villanova Church on the university campus on Monday, Jan. 5 at 7:30 p.m. Relatives and friends may visit at the church from 6 p.m. Burial will be in Calvary Cemetery, Conshohocken, at 9:30 a.m. Tuesday, Jan. 6. Contributions in his memory may be made to the Augustinian Fund: Care of the Sick and Elderly, c/o: Augustinian Provincial Offices/ P.O. Box 340, Villanova, PA 19085-0340.